If you want to get a new job you will certainly need to write a resume. This is your chance to make the first impression on your employer. HR managers read lots of resumes every day and it takes them just a couple of minutes to understand if you are a suitable candidate for a position. 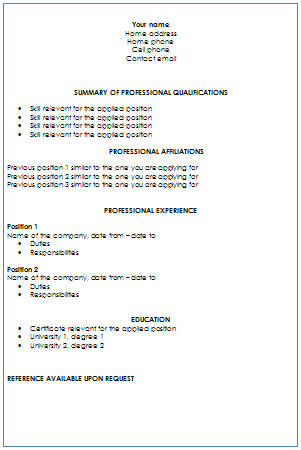 In case you want to maximize your chances to get a position you should learn the tips on resume writing. Our resume writing service wants to help you get the work you want. In case you think that you have all the necessary skills to get a position you should write a targeted resume. Targeted resume writing usually takes more time than functional or chronological one, for example. It will suit a person who probably doesn’t have great job experience but is qualified enough to fulfill certain work. Our resume writing service advices to highlight your experience, qualifications and experience that is necessary for the desired position. A targeted resume is more preferred among the HR managers because it shows at once all your skills. When writing a targeted resume you should put your accomplishments that will make you an ideal candidate for the position. Besides, you can list the qualifications you’ve gained at different courses or trainings. This resume is no longer than 2 pages and is unique for any position you are applying for. 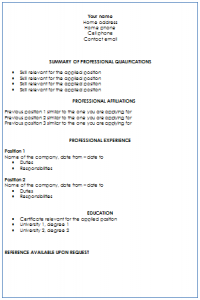 The format of the targeted resume is quite similar to the structure of a typical chronological or functional resume. You begin targeted resume writing with your personal information like name, address, phone number and email address. Then you write the objectives section. Here you put a couple of sentences about your career goals. The next section you write in a targeted resume is “skills and accomplishments”. This is the list of your skills, accomplishment and backgrounds making you perfect for the chosen position. Education and training section should tell the employers about your qualifications that will help you be successful in this or that job. Then goes the experience section where you put all the previous employers and positions. And don’t forget to put the dates of each work place. And the last section is to tell about your personal interests. Mention your hobbies that are relevant for the chosen position. Our resume writing service gives you this useful information because we want to make your job searching successful. Targeted resume writing requires a lot of efforts and in case you want to make it easier address to our resume writing service that will write an outstanding targeted resume for you. Our resume writing service wants you to get the work you want. Resumewritingservice.biz will make you an ideal candidate for the job of your dream.